I partied in a medieval turret over the bay. I was serenaded with a traditional song by an actor from Uzbekistan. I got an illegal red carpet selfie. I stood outside the Palais begging for a premiere ticket. I consumed more cheese than a ’70s gameshow addict. Oh and I saw some FILMS. This is a long-read article. Short on time? 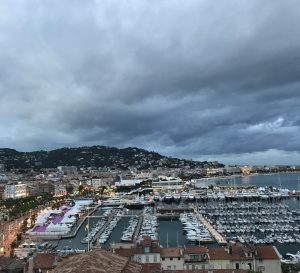 Check out my quick Top 15 Cannes Tips. 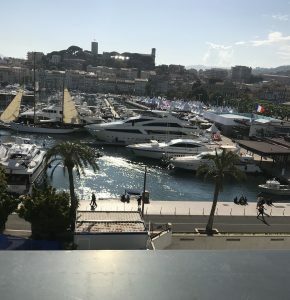 If you’re coming out of the Palais Du Festivals via the main exit, PLEASE don’t immediately stop and rummage in your bag for sunglasses, phone, or cigarettes. For people standing for hours with notices requesting invitations to premieres, it looks like you’re about to offer them tickets and it’s soul destroying when out come the Marlboro Lights or the Chanel sunnies. Yes! 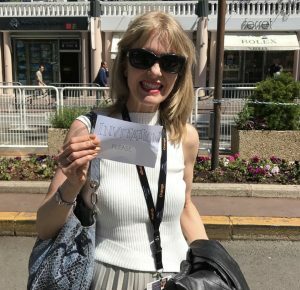 I went to the Cannes Film Festival, and I survived. While some other festivals only take place in their titular cities, Cannes is one of those that takes over the whole town. It makes for an immersive, exhausting, fun-filled experience. Deciding when to go (I couldn’t justify being there the whole festival) was tricky. In the end I went from the first Friday to the following Wednesday; Cannes veterans later told me that was the best weekend to be there. They hold press screenings right across the weekend; they start early and finish late every day. Of course there will be a couple of things that will be a priority for you. But I rather wish I hadn’t bothered trying to pre-plan in terms of what to watch. At that stage I didn’t really understand what I could get into with my press pass as I didn’t know what kind of pass I’d get. I’m also one of those people who really has to be there to get my bearings. Once I was there it was easy to plan a day ahead, and sometimes the first buzz from a premiere, or a film not in the main competition, will inform whether you do or don’t want to see it. 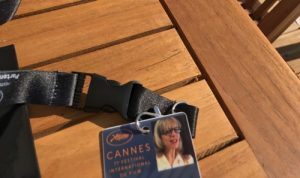 You may well have been emailed invitations to special events by publicists before you arrive, so you might have to accept those before you get to Cannes. I did find the security people incredibly helpful for checking if I was in the right queue (I get lost a lot). Travel Companion Or Go Solo: You may want to share with a fellow industry bod, or go it alone (you’ll get to see more movies that way but may be lonely). If you want to bring someone else, think carefully. You’ll be dashing around to screenings or meetings, and you need a non-clingy friend or relative who you can text at 5pm that there’s another screening you want to go to so you’ll see them at Cinema De Le Plage after the sun goes down. Leave clingy people at home unless you too are clingy and you’re in a mutually, destructively clingy relationship. What To Pack: It’s worth taking black tie / an evening dress in case you get an invitation to a gala event (though be prepared for the sadness of putting it back in your suitcase unworn at the end of your trip if you don’t). Officially it’s a smart dress code for daytime invitation events, and I love to dress up anyway, though I saw people very casually dressed on the daytime red carpet. Red carpet selfies are also banned, though a lovely Slovakian journalist I met in the Solo queue insisted on taking a picture of me for posterity. For daytime I took a lot of clothes, partly as the weather was set to be changeable and partly because once I’d decided my tiny wheel-along wasn’t big enough, my next smallest case was massive and of course had to be filled to the brim. My most worn item was a pair of black coated skinny jeans that I dug out nearly every night, as they were reasonably funky and (whisper) nice and warm. I am ancient though, and lots of beautiful young women were going for the skimpy-and-frozen approach, post-10pm. Still using that press bag, and yes those are the coated black skinny jeans. Haven’t taken them off either. 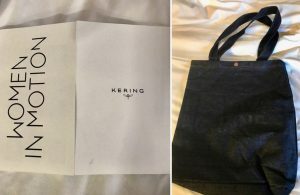 As Press you get a bag – this year’s was actually really nice, in blue denim, and while it may not be cool to tote them around they were (and remain) perfect for everyday use. You can even fit a laptop in them! I’ve used mine every day since I got home. Nice Nice: I’ll admit I got very excited when we landed at Nice airport and I realised that the actual airport is actually right next to the actual sea. Nice, or as they say in Nice, bon. Our Accommodation: I’d bitten the bullet and booked a tiny studio in an apart-hotel only a few minutes from the Boulevard de la Croisette (the main road parallel to the sea), where the Palais Des Festivals is. Only five minutes’ walk for me, or 10 at normal people’s walking pace. 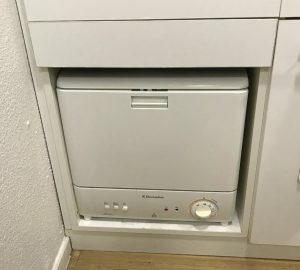 It was perfect with a tiny kitchen and an even tinier balcony, and the world’s smallest dishwasher, which didn’t work but that was fine as I had my own dishwasher, my older sister who was due to arrive that evening. The only things missing from the flat were enough coat hangers for all the outfits I wasn’t going to get to wear. Press Assistance: That first afternoon I ventured down to the Palais Des Festivals to register and collect my press pass. I was Yellow, the bottom rung of the press pack but still covetable, as I discovered chatting to a man sitting next to me at a 10pm BlacKkKlansman press screening a few days later. He was a filmmaker so had different accreditation, and had queued for three hours to make sure he’d get in. I’d pitched up at 9.40pm to be ushered into the small press line. My task on Day 1 was to familiarise myself with the Palais, which I’d just about managed by Day 6, the following Wednesday, when I went home. 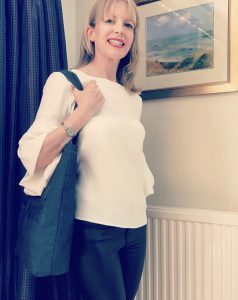 But this Friday I headed first to the Wifi Room; useful for writing up during the day or sending reviews, interviews and images back to base (for my one-woman website, base is me of course). I walked confidently in, before remembering I’d left my laptop at the hotel and walking unconfidently out again. Then it was up to the Journalists’ Terrace, new for 2018. It’s a terrific space for pausing and getting your bearings, with incredible views high up over the yacht-filled harbour. There are tables inside and out, and free coffee and drinks. Sitting up there in the late afternoon heat, overlooking that amazing view, was such a relaxing way to spend an hour. It can get busy but I never couldn’t find a seat. 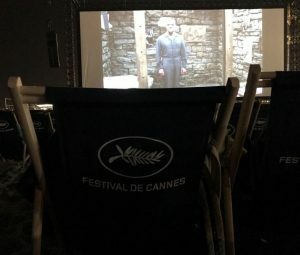 Screenings To Watch And How: All the theatres are in the Palais but for all of them you enter (and queue!) for the specific theatres from outside. For my first screening I got there an hour early, and I wasn’t the first in the press line. I gradually arrived later and later for daytime press screenings, and got in for everything. 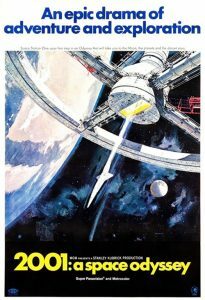 Even 2001: A Space Odyssey, which I queued for 90 minutes for, had spare seats up in the gods where we were. 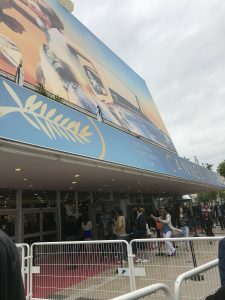 Be careful at night though – it can be hard to find a place to cross the road to the Palais and your screening theatre, thanks to all the barriers put in place before the big premieres, which stretch along the Croisette and half-way up the side streets. The huge queues for the premieres make it even harder to get to where you need to be. The main In Competition, high profile Out Of Competition and Special Screenings films may take up your time if you’re only there for a few days. But if you can, check out the parallel competitions like Un Certain Regard, and other showcase events such as Directors’ Fortnight. There’s also a short films competition. The festival website has a schedule for official selection and parallel selection films; though the Dailies, a paper fold-out screening list, is particularly useful. It’s given out free from 4pm each day in the Palais, and covers the next day’s main competition and parallel competition screenings, plus the main competition ones for the day after. It also lists which theatres they are in, and what you need for entry: invitation, badge, etc (some may have more than one screening a day, eg an invitation-only one at 8.30am in the Debussy and a badge-entry screening in one of the smaller theatres later). I had a lot of morning screenings at the Soixante theatre and tended to pick up the Dailies there. 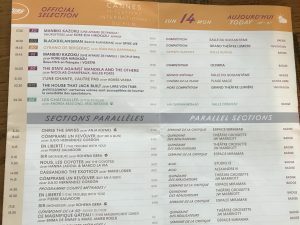 Screen Daily magazine is also handed out free on the Croisette, and has articles and screening listings, though many are distributor screenings. As it should be seen – on a massive screen and introduced by Christopher Nolan! I could have squeezed one in the afternoon I arrived, and gone to more evening screenings. If I’d been on my own I probably would have, though I’d have missed some of the events that really make Cannes. Premieres And The Red Carpet: The premieres are invitation-only. I did manage to get a ticket for Wednesday morning’s Solo from a friend; it was showing only twice and both were invite-only. 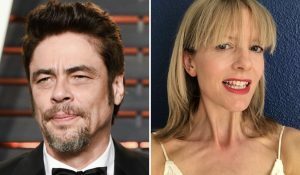 You will see people standing outside the Palais and along the Croisette with signs in French and English asking for tickets for performances that day – sometimes specifying the film, sometimes not. This isn’t as desperate as it sounds. If people with invitations don’t use them and fail to hand them back in time, they are penalised, so it is in their interests to give away any they can’t use. So on the Tuesday I decided to miss a press screening of Lars Von Trier’s controversial The House That Jack Built, on the basis that only one of these things had a chance of bringing me joy that day so I might as well try for an invitation. Standing outside the Palais exit, with a little sign saying Invitation Please, I was given one for a daytime premiere of En Guerre (with the director in attendance). I didn’t wear a ballgown but I did make an effort for that red carpet with a *nice dress*. 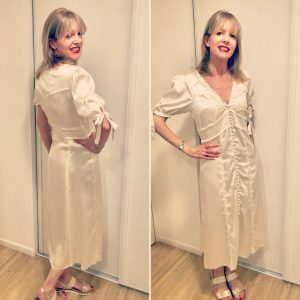 It was shown in the Grand Theatre Lumiere (the film, not my dress) which is frankly awe-inspiring (the Lumiere, and if I’m honest, my dress). I was also offered an invitation to Under The Silver Lake for the next afternoon which I couldn’t use as I’d have missed my flight home. A young woman standing next to me received one for Solo. People will also dress up in the evening and come down at gala screening time on the off-chance of getting a last minute ticket, too. We would have done this if I hadn’t had to get some actual writing done. By the way, if you get a ticket from someone else, check that it gets you in with your badge if needed, or if you need to be with someone with another badge. 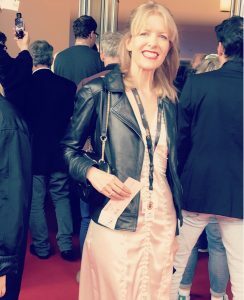 And, as I mention at the top of the page, if you’re coming out of the Palais Des Festivals via the main exit / sortie, PLEASE don’t immediately stop when you get outside and rummage for sunglasses, phone, or cigarettes as it looks like you’re about to offer waiting film-lovers your unwanted tickets. Free Entertainment: Don’t miss the free films on the beach, or Cinema De La Plage. Just a few minutes from the Palais, they play every night during the festival. Check the schedule as sometimes there is more than one in an evening (unsurprisingly not all films are English-language, and they may not be subtitled into English either – check first). Most start at 9.30pm though if you choose one with the director or stars in attendance (Ryan Coogler was there for Black Panther this year) get there early. Some are later; we saw Silence of the Lambs at 11.30pm, finishing about 1.30am. They lend you blankets, but it can get really, really cold. Wrap up warm, take some layers, and even better some thick socks to wear during the movie. You can’t take food in but there is a flat beach behind (still with a good view); eat your evening picnic there and either stay put for the movie or move into the deckchairs. But the best free entertainment in Cannes is people-watching. Especially in the evening when everyone arrives in their finery, and the stars are on the red carpet. 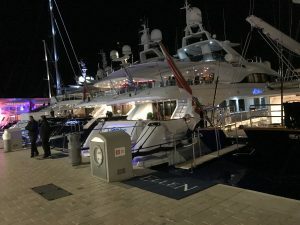 Don’t miss the huge yachts berthed in perfect rows in the harbour either, though as a nervous driver what most impressed me was their reverse parking. Cannes Nightlife: That first night my sister and I felt we needed to do something very Cannes-y to get us into the spirit of things. Blogs and articles had suggested Le Petit Majestic, an unassuming but central bar that comes into its own at festival time. Located on the Rue Tony Allard, it’s only a few minutes’ walk along the Croisette from the Palais. That evening it was very busy but most people were chatting standing in huge groups, so we got a table easily. The next evening a filmmaker friend called and invited us for drinks at the Grand Hotel, also on the Croisette. All very casual outside, though inside we could spy super-glamorous women and their evening-jacketed men supposedly having dinner (do they actually eat anything? I doubt it). Getting past the security staff to use the Ladies’ loo was an experience,. If you’re a mum it may be useful to discover the French for “I’ve pushed out two babies and I need the Ladies RIGHT NOW” before you get to France. On the Monday night we headed off to a party, thanks to a friend who put our names down then emailed me to tell me to go. With actor Sean Cronin. Never feed me vodka after midnight. Or indeed before midnight. And thank god she did as it was fabulous. It was held in the Musée de la Castre above the harbour at the very top of the Old Town. 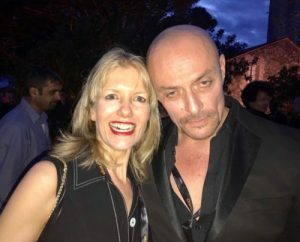 We had a fantastic evening watching the sun go down over the sea from an old stone turret, while drinking free vodka and chatting to actors including Sean Cronin, who was very entertaining about his career playing villains and drug dealers. Decision-making: There will inevitably be some clashes. 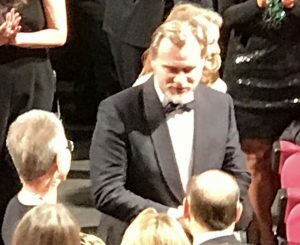 On the Saturday I wanted to go to a talk by Christopher Nolan, but was asked by my friend to go to a distributors’ viewing of a British independent film, No Shade. The Nolan talk would have been fascinating for me, and great for social media posts, though I’m not sure it would have done anything for this website. 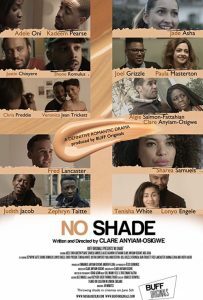 So I went to the No Shade viewing, loved the film, and published my review while I was in Cannes – it immediately had lots of traffic, plus I met the (very inspiring) director Clare Anyiam-Osigwe and her producer Emmanuel Anyiam-Osigwe (Clare’s husband and the founder of BUFF, the British Urban Film Festival, in London). My point is, that decision turned out to be absolutely the right one, personally and professionally. But that won’t always happen. Sometimes you’ll have to make a call and it’ll turn out in retrospect to be the wrong one. That’s just something you have to chalk up to experience, and sometimes to chance. And if you’re now all dwelling on wrong movie-related decisions you’ve made in the past, just to make you all feel better, I also managed to miss the screenings of Shoplifters when I was in Cannes, the film which eventually won the Palme d’Or. This after really enjoying director Hirokazu Kore-eda’s last film The Third Murder, so I can’t even claim ignorance. The country pavilions. Apparently the Irish have the best parties! International Village: The country pavilions (the little pointy tents by the sea) are a great way to network. Get yourself down to yours and introduce yourself. If you can, find out in advance of your trip what events they are hosting during the festival. Get Networking! Go on, prise yourself away from that comforting wall. Even I managed to network, sort of properly, considering my usual technique is to trip over someone’s expensively clad foot then try to scrounge a cigarette of them. 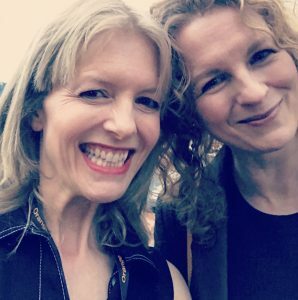 I went to a Women In Film And TV networking event, which also looked at women’s representation in the industry. For once I plunged right in and chatted to a producer I met there, rather than standing in a corner looking lost, a speciality of mine. 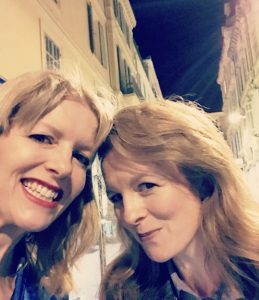 Who You Know: I bet you think you don’t know anyone at Cannes… neither did I, though it turned out I did. Think about your contacts in the sector – they may be filmmakers, actors or distributors rather than writers. I also came back with several business cards, and yes you do need to follow them up, though wait until everyone has had a chance to get home. Obviously if you’re planning on meeting up with a contact you’ve never met before, usual safety provisos apply. Meeting people: Realistically, if you’re on your own you’ll try harder to make friends. A lot of journalists will know each other, or of each other. I can’t say it was overflowing with middle-aged first-timers like me. Luckily being British I’m entirely unfazed by queuing, and that’s often when you get to chat to people. The irritating people probably don’t hang around. Waiting in line for Solo, two young women, annoyed at having to queue for a new Star Wars movie a week before the public could see it, were telling us about their LA jobs involving press junkets and parties and never having to queue for anything. We were near the front of the line but after about 10 minutes they decided they weren’t prepared to wait, and went to brunch. Food And Drink: Well Eat, anyway. If you get the Pray and the Love too that’s one hell of a Cannes and I take my hat off to you, Medieval Film-Loving Pope. We found a couple of supermarkets (check each way out of your accommodation – one was considerably better than the first one we found, in the opposite direction). You can smoke in the street but you can be fined if you drop cigarette butts. There are plenty of smokers’ bins though. We lived off camembert, bread, salad, fruit, crisps, water and free wine. That Cheese Diet In Full: Amazingly I lost 4lb when I was away; it turns out camembert combined with A LOT of walking is quite the body trimmer. Plus I’m not big on breakfast, and often I’d go from a mid-morning screening to a lunchtime one, emerging bleary-eyed into the sunshine at 4pm having eaten nothing. Then I’d pop home, have a big plate of – YES! – camembert and salad, and go out again. (Though how much you eat may be film-dependent. Ash Is Purest White is full of great food and left me salivating nearly as much as the Stanley Tucci / Minnie Driver starrer Big Night did back in the 1990s). The one day I didn’t slather myself in factor 30, I was standing for two hours asking for a ticket, and came away with my pink skin contrasting nicely with my white top. I also took a mini first aid kit. Yes there are plenty of pharmacies (the one opposite the Palais has a condom machine on the wall outside should you require it) but if you’re going to be rushing everywhere there’s nothing wrong with having your own supplies. And plasters in case your sandals aren’t as comfy as you expected! Speaking French: In the UK we usually learn French at school; I studied it from age 11-16 back in the 1980s. I was reasonably impressed at how much I could still read in Cannes, though my understanding when people spoke to me wasn’t great. Everyone working at the festival itself spoke English, though I did try to speak some French, especially to the friendly security staff – a *bonsoir* goes a long way especially if it’s actually nighttime. And I managed one conversation with someone who spoke French and a little bit of English; both equally un-proficient in each other’s language, we managed to keep going for a good 10 minutes. By the way, more than one person has asked me about English subtitles at press screenings. French language films have English subtitles, and films in other languages have English and French subtitles. Festival Security: There are lots of security checks, and they will look in your bag and make you walk through a beeper every time you go in to the Palais (all the theatres are in the Palais as well as the wifi room, journalists terrace and interview rooms). They do confiscate – one man was questioned about what looked like a keyring with a penknife attached; someone else had their apple taken away. You need to open your bag for them. The security people are helpful and friendly though, so be nice back. How Much I Spent: My big cost was accommodation and that was pre-paid (and non-refundable. I certainly gulped booking that online). I’ve just checked and for what we paid per night we could now, out of film festival season, have stayed in a 4 or 5 star hotel. That’s supply and demand for you. But I actually didn’t spend that much money when I was there. We only got one taxi (to the party in the castle – though to be honest walking “up hill and left a bit” would have worked just as well. We walked back using Google Maps). We self-catered, and it’s not like Cannes is short of free drink. Plus the Journalists’ Terrace and other areas of the Palais provide free coffees and soft drinks. One night we did settle down at one of the huge bistros opposite the Palais for dinner before realising it was about €30 for a sandwich. 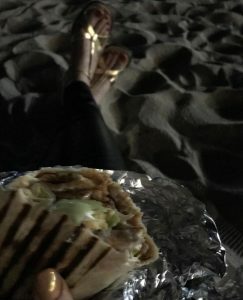 A quick getaway later and we paid €20 for two huge kebabs and two bottles of soft drink, and were sitting on the sand at Cinema Le Plage waiting for Silence of the Lambs to start. The BIG cost is the accommodation, and if from outside Europe, the flights. Some people stay out of town and travel in. It’s probably cheaper this way, and you also get a respite from the madness. But I’m glad we stayed in Cannes. Knowing I didn’t have to lug round everything I needed for the day, including a laptop, made things much easier; and I could also pop back and write in our room. My Highlights: Seeing Solo: A Star Wars Story a week before everyone else was very exciting. 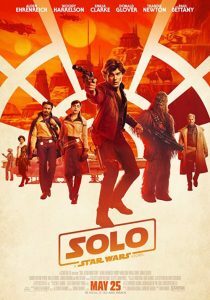 It’s a total blast: Ehrenreich is actually really good as Han, we find out why his surname is Solo, and no one cares who anyone’s parents are. 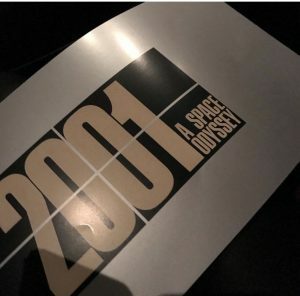 But the absolute highlight was watching an un-restored print, as it would have been seen on release in May 1968, of 2001: A Space Odyssey for its 50th anniversary. 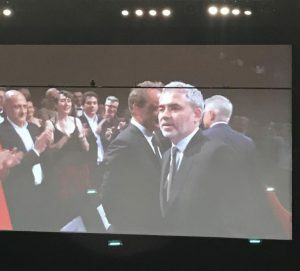 It was in Cannes’ Debussy Theatre, introduced by Interstellar and Dunkirk director Christopher Nolan, a huge fan of the film; who pointed out that the Debussy is one of the few theatres in the world which can play the soundtrack as it should be heard. 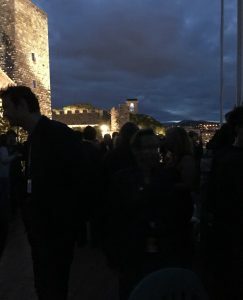 And I have to include that party in my highlights – in the castle above the Old Town, looking over the bay, as the sun went down. 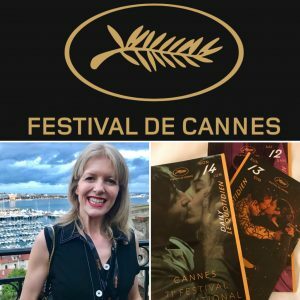 Next Year: If I manage to make to to Cannes in 2019, I need to do the things I didn’t get to do this time around – interviews, press conferences etc. Basically I need to be bolder, with more teeth, and also go to more parties. A sort of louche Jurassic World dinosaur. More Information: I’ve linked to my Cannes film reviews in the Filmworker section above, or use the Festivals tab in the menu. There’s also my quick-read Cannes Top Tips. And read about my trip to 2017’s New York Film Festival here. AlmostGinger.com. 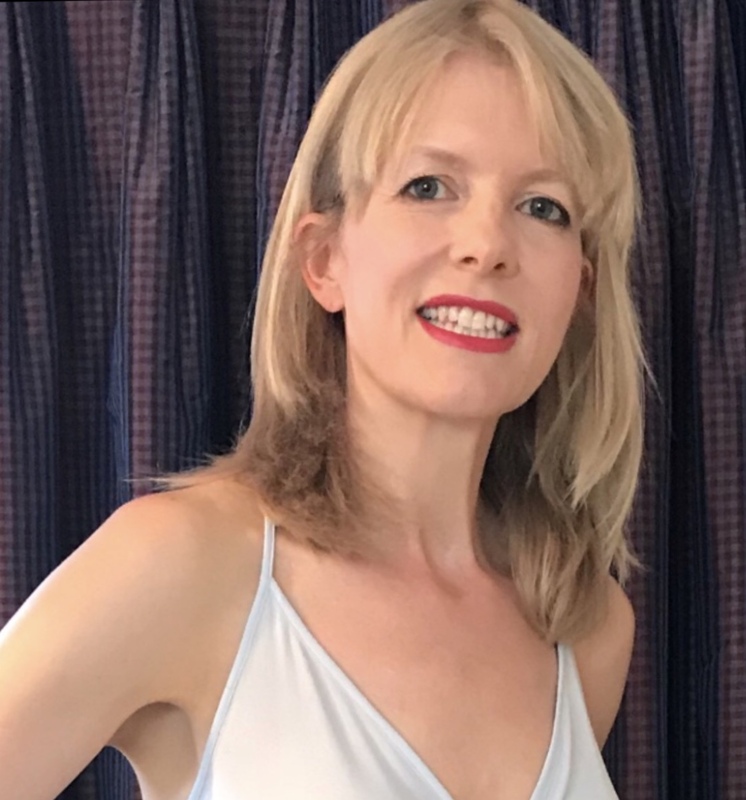 A big thank you to Rebecca who runs this website about her film interests and travels. She doesn’t know me but her Cannes posts were entertaining and useful when I was deciding whether to attend and what to do once I got there. StephenFollows.com. 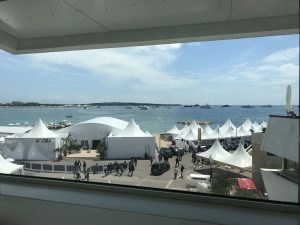 Stephen runs his own fascinating website about the film industry, with an excellent article about Cannes, which is based on extensive research among attendees. It’s from the perspective of buyers and sellers but is still very useful. I’ve found the Cannes Film Festival website to be 50% brilliant and 50% a nightmare but you will need to use it if you apply for accreditation. Brilliant story from what looks to have been a fascinating adventure. May I ask how long you need to be writing and reviewing before qualifying for press. All things film and tv have been a passion of mine for over a hundred years and I’d like to become more involved. Thank you! I started this website in Autumn 2016. I don’t know what Cannes’ criteria are for website traffic (and I don’t think you need your own site – if you write for other outlets that should count too). I can’t remember if I had to provide traffic data when I applied for the New York Film Festival or the London Film Festival last year, but if I did then the numbers would have been a lot lower as the site has grown a lot since January.